I’m having a rip roaring time at the moment. 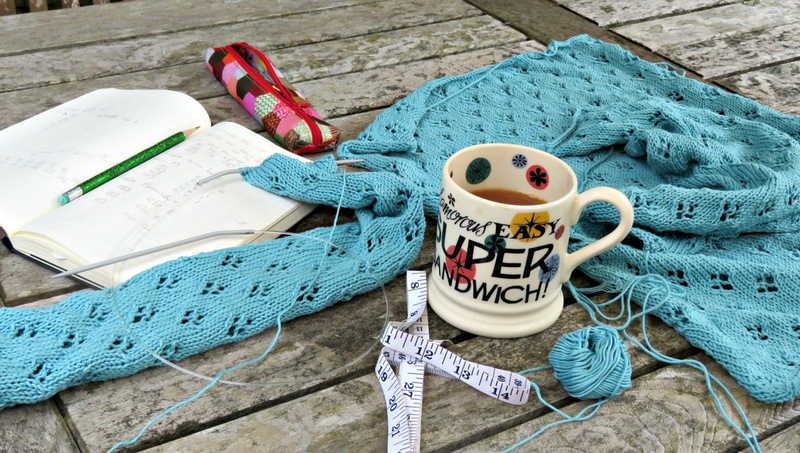 I’m knitting a summer cardigan using a 4-ply cotton yarn in a lovely sea-blue colour that really makes my heart sing. As usual I couldn’t find a pattern that gave me what I really wanted so I’ve set about designing my own perfect cardi. Working out how to make it all hang together with consistent pattern repeats has been pleasingly mathematical, which isn’t to say that it’s all been plain sailing. When I knit a really complicated lace pattern I start off by working a sample square for a few pattern repeats using thick needles and a light coloured aran or double knitting weight wool. 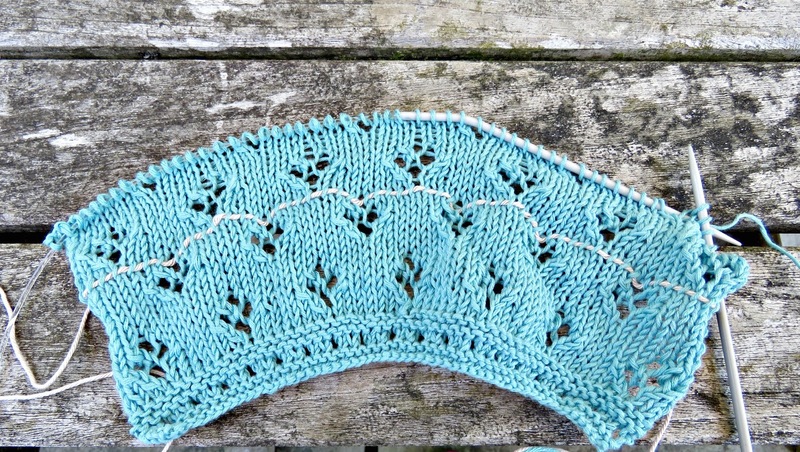 You’d never normally use such a thick yarn for lace, but if you practise your pattern with a thicker yarn at the outset you’ll find that it’s much easier to see what’s going on. I have rubbish eyesight so I find it really helpful to work a large-scale model of the stitch-work to get my head around the mechanics of how to put it together before I get started for real. Remember also that it’s much easier to see the stitches if you use a light coloured yarn. Black and the darker tones tend to hide stitch definition and, for those of us who are optically challenged, that's just not helpful. Once I’ve got the pattern straight in my head I’ll try a tension sample. I’ll knit something that’s about 10 cm square using the yarn that I’m planning on using for the project. I keep a careful record of the number of stitches and rows knitted in order to double check that the garment is going to knit up to size. It’s better to realise at the outset that your tension is off-kilter with the dimensions that you’re trying to achieve. 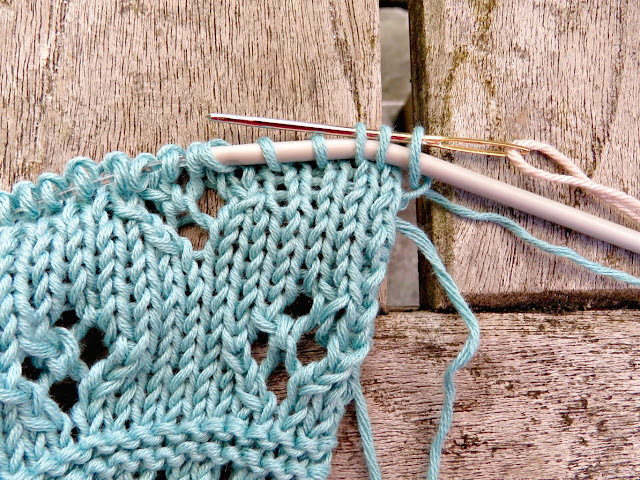 That way you can make adjustments to the number of stitches cast on, the size of needles used or the number or rows knit in order to produce something that’s going to fit comfortably. At the beginning I take huge care to count my stitches at the end of every pattern row just to make sure that they’re all present and correct, and that I haven’t lost any. It’s the easiest thing in the world to miss a yarn-over, and it’s best to keep a count as you go rather than race ahead to the next pattern row and have to rip back. I usually work to a design in my head, so it’s quite experimental as I go along. Shaping for the armholes and the neckline always brings its own special challenges. To make my life easier I use multiple lifelines to mark the rows on which I start to shape the armhole and the neckline. Again I keep a careful record of the row number that each one corresponds to. 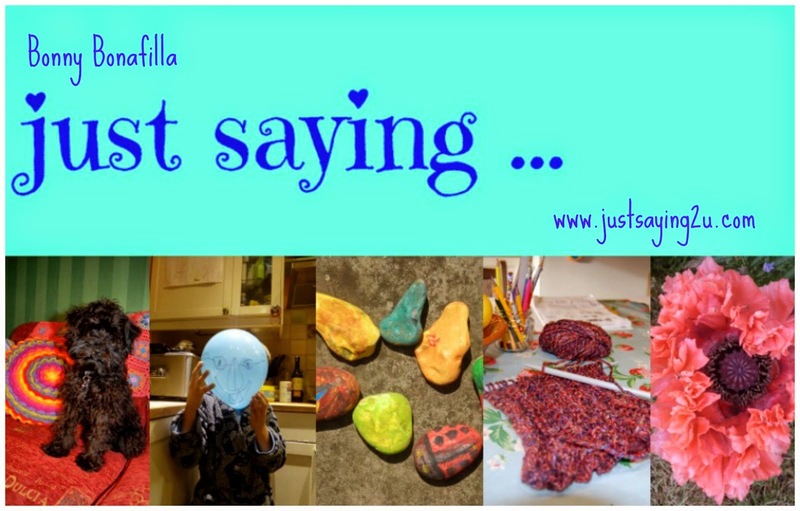 If you’re juggling pattern repeats with shaping you’re much more likely to make a mistake on the upper sections of the front sides and the back (thus speaks the voice of bitter experience!). This is where your lifeline is most likely to save you a whole lot of ripping and angst about the exact row that you’re on. 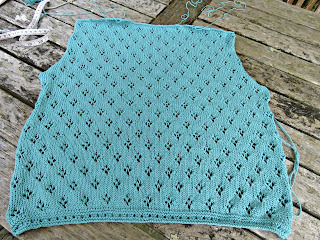 When I’m knitting a cardigan or a jumper I always, always start with the back. This is usually the largest section that you will have to knit, and I find that it’s good psychologically to get it out of the way first. When I’ve done the back I feel that I have, in a real sense, broken the back of the project. Ideally you never want to have any mistakes in your work, but if you make a mistake on the back, when you're still mastering the pattern, it’s probably not going to get noticed quite so much as on the front. I'm a big fan of blocking. It turns curled-up knitting into a well-behaved textile that is so much easier to match, sew up and finish. 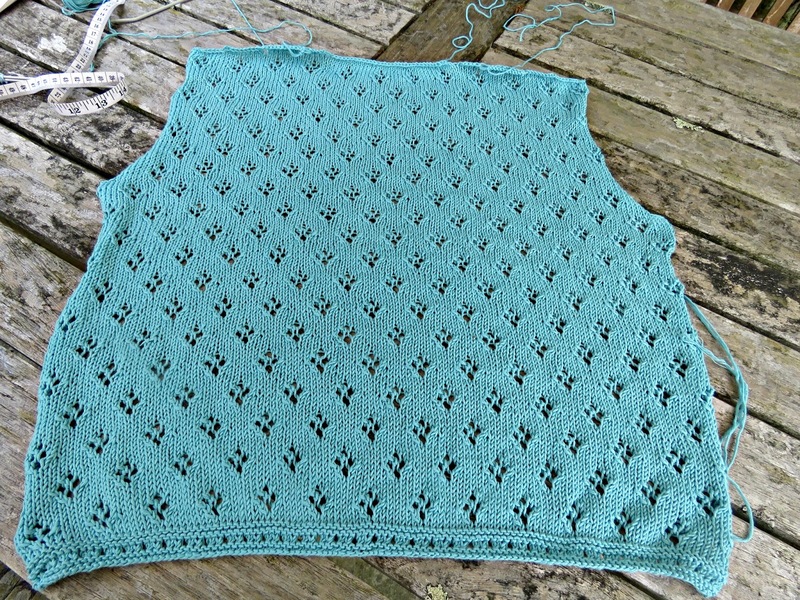 And if you're working on a lace pattern you really won’t know what you’ve got until you’ve blocked it. With mohair lace patterns blocking is even more important. It opens up the holes that you’ve worked in the fabric and sets your design into the form that it was always intended to take. As a result I always take special care to block each section once it’s finished and before I try to assemble the garment. I’m sure that I’m somewhere worrying on the OCD scale, and, at the risk of ringing alarm bells, I’m going to admit that I like to keep a careful written row count. You could use a row counter that attaches to your needle, but they’re awkward on the circular needles that I normally use, and they’re easy to overlook. I’m Old School: I prefer to use a pencil and a notebook. I find that an accurate row count really helps when I’m trying to match front and back armholes. So many patterns just tell you to knit to a dimension, as in shape the armhole when the work measures so many centimetres. This is all fine and dandy, but it’s so easy to persuade yourself that you’ve reached your destination when you’re doing a front to match a back and feeling just a little bit jaded/ been-there-before about the whole business. Sure you can carefully measure your work with a tape and judge the sizing by sight, but I like the security of knowing that I’ve done exactly the same number of rows on each side at the front and on the back. It’s possible that you could undergo some sort of physical or mental trauma mid-project that could change the tension of your work, but let’s face it: it’s a bit unlikely, and, if something like that happens, you’re probably going to have much bigger issues to think about than the niggledy mismatch between the back and front armholes of your not-quite-perfect summer cardigan ... . Remember when picking up stitches to knit the front bands on the perpendicular to the grain of the main body that your stitches are not square: they’re rectangular. As a result you probably need to pick up 3 stitches for every 4 rows so that your bands sit flat. Check out your tension sample to see that you get the fractional pick-up rate right. Working on a seamed garment gives you a special opportunity to weave loose ends into a seam where they’ll never again see the light of day. And this means that you should always, always aim to join a new yarn at the end of a row. If you’re running short of yarn, and you’re working long rows it’s tempting to try and get your value out of every last thread. Look at how much yarn you’ve got to work with and, if it isn’t at least 3 times the length of the row you need to cross, you’re probably going to have to work a join in the middle of the row where it's going to be trickier to darn in the tails. And so that’s it: my 10 top tips for working a care-free cardigan. If you've got any special tips on how to minimise the knitting angst, please pass them on.